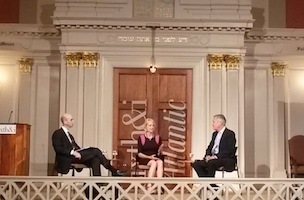 Last night at Sixth & I Synagogue, The Atlantic presented “American Futures,” a conversation with Atlantic National Correspondent James Fallows and his wife, author Deborah Fallows, about their travels across America in a propeller-driven plane documenting small towns. In the current issue of The Atlantic, James documents his case “for why cities work when Washington doesn’t,” through conversations with mayors, librarians, and YMCA employees – among others -in cities including Greenville, SC, Burlington, Vt., and Sioux Falls, SD. The Fallowses, who solicited destinations online, received more than 1,000 suggestions of small towns for which to visit that were experiencing dramatic economic, cultural, and social changes. For more on their journey across America, click here.